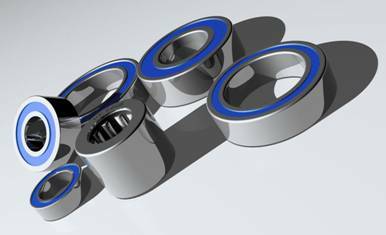 PYC rc car bearings have both metric and standard(inch) size ball bearings with steel shields, Teflon, Polyamide and rubber seals.we is a specialized manufacturer of various ceramic bearings rc,rc ceramic bearing,ceramic bearings for rc,bearings for rc. The performance advantage of ceramic hybrid ball bearings has been well established in the racing industry, and they are now standard equipment in NASCAR, Formula 1, USAC, NHRA, and many other professional racing venues. They are now becoming more popular in karting and quarter midget racing, where a small performance advantage may separate the winner from back-of-the-pack. Advantages of ceramic bearings include:60% less rotating mass40% minimum reduction of friction!3 to 5 times longer lifeLess heat generationTighter tolerances and less deflectionLess lubrication needed, 15% grease pack.